The Conjuring Universe is seeing another of its standalones get a sequel — and a red-hot writing talent will help bring it to the screen. Akela Cooper, a TV veteran whose writing credits include The 100, American Horror Story, and Luke Cage, has been hired to pen the sequel to the 2018 horror hit, according to Deadline. It'll be the scribe's second produced feature screenplay; she also wrote last year's slasher Hell Fest. The burgeoning cinematic universe anchored by the Conjuring films and masterminded by James Wan (Aquaman) is quickly becoming a cash cow of the highest order. 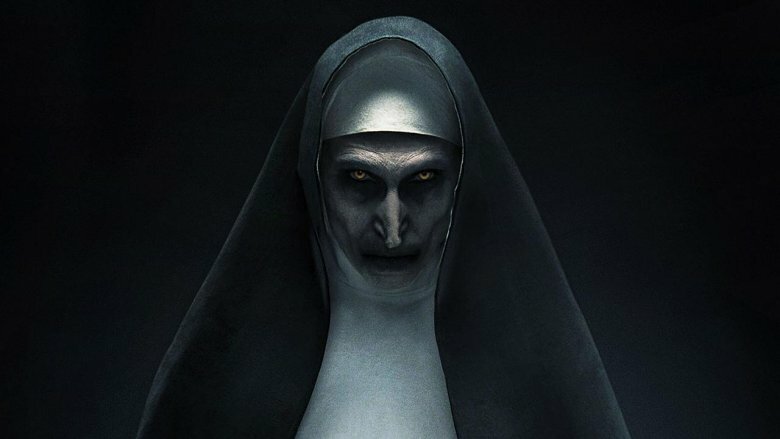 The five films in the series have so far grossed an impressive worldwide total of $1.569 billion dollars, and of those five flicks, The Nun is the highest grosser of them all with $365 billion dollars globally, outperforming even the main series' two entries. The shared universe shows no signs of slowing down; this summer will see the release of Annabelle Comes Home, the third film centering on the creepy possessed doll introduced in The Conjuring, which will see longtime series scribe Gary Dauberman make his directorial debut. Already on tap for next year is the as-yet untitled Conjuring 3; these two films alone could (and probably will) put the series as a whole over the $2 billion dollar mark worldwide, quite impressive for a horror franchise. Cooper will bring a bit of fresh perspective; the two Conjuring films were scripted by the team of Chad and Carey Hayes (with an assist from Wan and David Leslie Johnson-McGoldrick on the second installment), while Dauberman has handled all three spin-off entries. According to Deadline's report, she caught Wan's attention by way of her script for M3gan, an "A.I. doll thriller" which is being jointly produced by Wan's Atomic Monster production house and those ubiquitous horrormeisters at Blumhouse. She's also contributed to the forthcoming Netflix superhero series Jupiter's Legacy, starring Josh Duhamel; that series is based on the acclaimed comic series from Mark Millar, which debuted in 2013. Obviously, Cooper is a writer who feels most at home within the horror and superhero genres (she's also worked on the animated series Avengers Assemble and the NBC horror series Grimm), and it's worth noting that her hiring strikes a decisive blow for inclusivity. After all, it's not every day that a talented woman of color is handed the keys to a top-grossing horror franchise; assuming that The Nun 2 follows in the footsteps of its predecessor by making pretty much all of the money, the gig could very well help to open doors for others down the road. It should also be noted that The Nun 2 isn't the only interesting project she has in the pipeline. She'll be serving as showrunner on another intriguing series that's on the way from Netflix: Chambers, which tells the story of a young heart attack survivor who begins to take on some of the more sinister characteristic of her organ donor. Newcomer Sivan Alyra Rose will lead that series, which also counts Marcus LaVoi (Den of Thieves), Tony Goldwyn (The Belko Experiment), and veteran actress Uma Thurman among its cast. We feel safe in saying that Cooper is a talent to keep your eye on, and her involvement in The Nun 2 should allow Dauberman to just relax and breathe for a few minutes; in addition to pulling double duty scripting and directing Annabelle Comes Home, the scribe has had his pipeline jam-packed full of writing projects. He penned the scripts for the upcoming It: Chapter Two and Are You Afraid of the Dark?, is writing and producing streamer DC Universe's soon-to-be-released Swamp Thing series, and has also reportedly been hired to do the same for The Terrestrial, a mysterious, long-gestating alien abduction drama that began development for USA Network way back in 2014. Obviously, there has not yet been any announcements as far as cast, crew, or potential release frame for The Nun 2 — but with Conjuring 3 set to scare up the big bucks next summer, a 2021 release for the demonic Valak's sequel seems likely. We'll keep our finger on the pulse of this one, and report additional details as they become available.